New Flyers goalie Petr Mrazek. Flyers general manager Ron Hextall decided he wasn't going to wait any longer before getting his team some goalie help ahead of next week's NHL trade deadline. 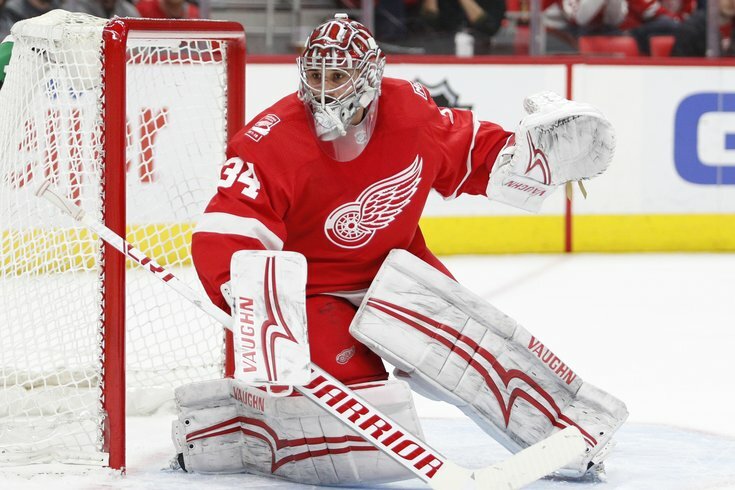 On Monday night, the team announced it had acquired Red Wings backup Petr Mrazek for a pair of draft picks. "We’re excited to have obtained Petr Mrazek," Hextall told reporters during a conference call on Monday night. "Petr is a proven NHL goaltender, and given the situation we’re in, we needed a proven goaltender and we got one." Both the picks Hextall spent for Mrazek are conditional, and while it was announced as a fourth-round pick in 2018 and a third-round pick in 2019, it can actually go as high as a second in 2018 and a third in 2019 if the Flyers make a postseason run. "The picks, it’s a fourth [round pick] in 2018 that can move to a third [round pick] if we make the playoffs and Petr wins five games in the regular season," Hextall explained. "That same pick can move to a second [round pick] if we win two rounds of the playoffs and he wins six games. The additional third rounder in 2019 is if we re-sign him." Mrazek, 26, is in the final year of his two-year contract and comes with a $4 million cap hit, although Hextall confirmed Detroit will cover half of that. More importantly, however, is what the goaltender insurance policy will cost Hextall in terms of future value, especially for a player who will be a free agent at the end of the season. Part of the reason Hextall decided to make a move has to do with the lower-body injury suffered by backup-turned-starter Michal Neuvirth over the weekend which, it turns out, is worse than first suspected. "Michal’s out long-term," Hextall said. "We’ll let you guys know probably tomorrow, try to give a definitive timeline. But it is longer-term, not short-term. I’ll know for sure tomorrow. It’s not days, it’s weeks – I know that much." Last week, albeit when Neuvirth was still healthy, Hextall reportedly turned down an offer from Detroit that would've sent Mrazek to Philly for just a third-round pick. The Flyers paid almost double that on Monday. But with starter Brian Elliott expected to be out until late March –and now Neuvirth out for "weeks" – Hextall didn't have much of a choice but to make a move, something he said he was considering doing if Neuvirth hadn't gone down. It was either that or ride Alex Lyon, who just picked up his first NHL win in relief of Neuvirth on Sunday. "You have to pay," Hextall said when asked about the goaltender market. "I think quite frankly when I look at this deal, I think it’s a fair and reasonable deal for both sides. If Petr performs, we pay more, Detroit gets more. If he doesn’t, they still get paid and it costs us a certain amount, but it’s not overpaid. If we do have success and we pay, then that’s good. It’s good for Detroit, good for us. "I like the makeup of this deal, I think it’s a fair deal, and I think both teams got what they wanted." In 18 appearances this season, Mrazek has gone 8-7-3 with a 2.89 GAA and a 9.10 save percentage. In his six seasons with the Red Wings, the former fifth-round pick has appeared in 166 games and has a record of 72-58-20 with a 2.60 GAA and a .912 save percentage. In 2015-16, Mrazek had the best season of his career, going 27-16-6 in 54 appearances with a 2.33 GAA and a .921 save percentage. And that's the kind of experience Hextall wanted to find without having to pay any more than he already did. After all, his team fought hard to work its way out of the basement of the Metropolitan Division and into playoff position. Currently, the Flyers are in third place in the division at 30-19-10 (70 points). "This is a sign that our players have done a really good job," Hextall said when asked if this deal was a sign he believes the Flyers to be contenders. "They’ve worked extremely hard. We’re in a tough situation – you lose your top two goalies when you’re fighting for a playoff spot, and our players have worked hard for a long time now, and I didn’t feel like it was fair to not have a proven NHL goaltender for this team. That’s the reason we acted. "Our focus right now is to make the playoffs, and if we make the playoffs, then we’ll go from there." In related goalie news, the Flyers activated Anthony Stolarz and sent him to the Phantoms as he continues to recover from knee surgery just prior to the season. Last week, Hextall said he hoped Stolarz, who was expected to be the Flyers third goalie this year before his injury, would be able to return to game action at some point in March. "He needs practice," Hextall said. "He hasn’t had a full practice, so again, as I told you guys a week or ten days ago or whenever it was, it’s a matter of ramping him up day by day and seeing where it goes. There’s some trial and error there, and Stolie’s got to be comfortable with where he’s at. Just the whole timing thing, from a goalie’s perspective, it takes time to get your timing back. "So I still don’t know a timeline, but it’s not in the real near future here." At least now, with Mrazek on his way to Philly, there's no need to rush Stolarz back. Those weren't the only two moves the Flyers made on Monday. They also announced that they recalled Oskar Lindblom from the Phantoms. The 21-year-old left wing will be available to make his NHL debut on Tuesday night against the Montreal Canadiens. When asked why and how he was able to recall Lindblom, Hextall said there may be another injury announcement coming on Tuesday. Lindblom, who spent the previous four seasons with Byrnas (Swedish Hockey League), has posted 34 points (16 goals, 18 assists) in 54 games this season, his first full season with the Phantoms. A fifth-round pick in 2014, Lindblom represented Lehigh Valley at the ÅHL All-Star game this. During the preseason, Lindblom notched a goal and an assist in four games with the Flyers.